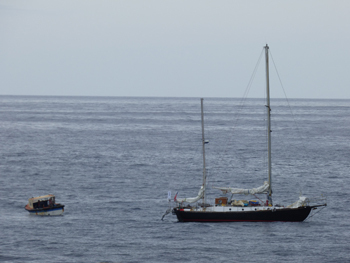 The two masted yacht Endeavour arrived at Tristan from Uruguay on the afternoon of Monday 18th February 2019. The weather was not good, so she went to the lee and returned the following afternoon. Sadly, with the passing of a community member, all work on the island stopped as a mark of respect, so landing was not possible on Wednesday. Early Thursday morning, the launch visited the yacht and brought the only crew member ashore. 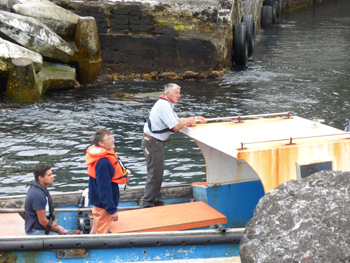 After immigration was completed we assisted the yachtsman, Andres, in getting supplies, water, fuses, batteries and washing. There was even time to have a toastie and tea at Café da Cunha. Around 1:00pm, Andres returned to the yacht with all his supplies and set sail for Cape Town later in the day. Yacht Endeavour anchored off Calshot Harbour. The launch bringing Andres ashore.